Two's Company, Three's A Crime. Rated PG-13 for some sexual content, language and violence. 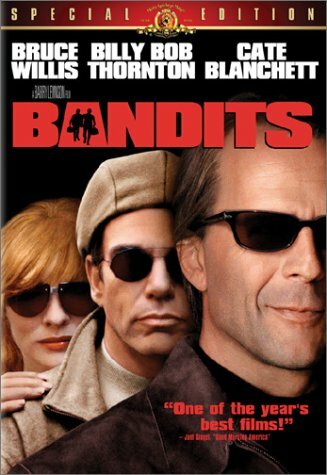 A charismatic convict and a hypochondriac inmate break out of prison and immediately start a bank robbing spree. Becoming known as the "Sleepover Bandits", the two kidnap bank managers the night before their robbery, spend the night with their families, and then all go to the bank in the morning to get the dough. Using a dim-witted stunt man as their getaway driver, the three successfully pull off several jobs that gets them recognition on a tv show about America's criminals. When a housewife with a failing marriage decides to runaway, she ends up in the hands of the criminals. Initially attracted to Willis, she nonetheless also ends up in bed with Thornton and a confused relationship begins. Continuing along with their spree, the bandits hit the wall when the bank managers realize that they are non-violent and therefore no threat to them or their employees. This leads to one more big score at the Alamo Bank, where in the opening scenes, things appear to go awry. The "Sleepover Bandits" will get you in! What a winner of a little movie! 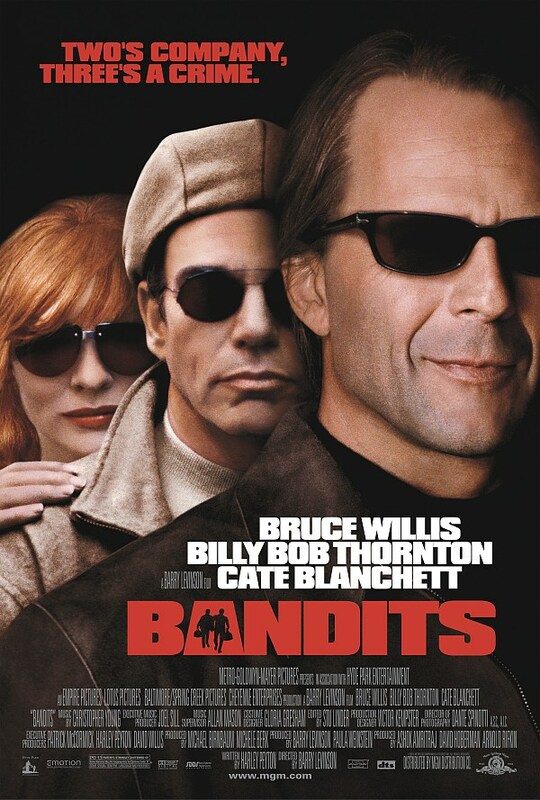 I say "little" on account of the fact it never aspires to being anything other than what it is, a non-larger than life tale of a bandit, his reluctant co-conspirator, a manic depressive housewife and a wannabe stuntman. 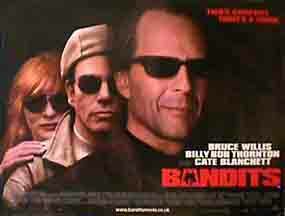 By far and away Bruce Willis' best role since DIE HARD. He is the eminently likeable Joe Blake, innovative but small time bank job specialist who breaks out of jail by seizing a rare window of opportunity and dragging along, more by luck than judgment, passive and ultimately quirky Terry Collins. Billy Bob, who with his chameleon capabilities never looks the same in successive movies, is equally lovable as Collins, a simple man with a simple plan - to just be happy! Subtle yet hysterically funny in execution, Ms Blanchett is inexorably drawn into the lives of the two convicts after her character, bored housewife Kate Wheeler, flattens Collins with her car. Five star outing from Cate Blanchett here who so totally balances the lives of the other two men in her 'borrowed' life. Disparate and at opposite ends of the spectrum, she loves them both and tells them at once stage "Together you make the perfect man! "So true! Caper follows caper until she must chose between them, which of course she cannot. Thornton takes "quirky" to a new level here (how this can be the same man who played Karl Childers in SLING BLADE is a poser of some magnitude) So many delightful touches to the film you simply have to watch it multiple times to catch them all. I will not give away anything in terms of the concluding plot-line but if ever there was a feel good film - then this is it! Even at 2 hours plus, one finds themselves wishing it didn't end! All the leads are simply brilliant, I could not insult the others by nominating a preference. Long time since I saw such a thoroughly tasteful movie with absolutely no bad language that I can recall. I would suggest it merits conservatively a 9.5 rating.